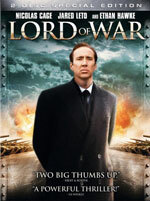 Jason and I went to see Lord of War on Saturday night. It was better than I expected and both of us enjoyed the movie. The movie is a narrative told by Yuri Orlov (Nicholas Cage), a charming, intelligent, and witty gun runner who is a disgusting mess of a person. The film itself seems ambivalent towards Yuri; sometimes, it snuggles up to his humanity only to reveal just how morally repugnant true amorality can be. From the opening title sequence over a smart short film about the life of a bullet to the sobering footnotes at the movie’s end, Lord of War is a black dramedy. The subject matter is dark and exciting, but laughing is the only way to keep from crying at the absurdity of the small arms trade and its disregard for human pain and suffering. This site is now running on TextDrive‘s servers. I made the switch because they were running a special “Hosting for Life” promotion that will save me a lot of money in the long run; I’ve also heard a lot of good things about TextDrive and their focus on great hosting service for people who “get it.” I plan to move all of my other sites to TextDrive in the coming weeks, so there may be some downtime. I highly recommend you take advantage of VC3. Over the past five years, I suffered with the painfully slow dial-up connection at my house whenever I returned home for summer and winter breaks. I never hesitated to explain to my parents how DSL wasn’t much more expensive than dial-up. I offered to help pay part of the cost difference. Explaining how much extra time it took me to FTP hundreds of files or download program updates was fruitless. I watched the prices of broadband creep lower as everyone—it seemed—realized that their time wasn’t worth the wait. I begged, I pleaded, I argued, I reasoned, and finally gave up hope. In two weeks, I’ll be moving to Baltimore and changing my permanent address. This morning, my parents signed up for Verizon DSL. I’m making gradual updates to this site because I probably won’t have the time to devote to major changes for a few weeks. I changed the way RSS/Atom feeds are handled by using Steve Smith’s FeedBurner Plugin along with my new FeedBurner account. It’s a sweet WordPress plugin that will redirect any and all of my feed traffic to my FeedBurner Smart Feed. You’ll get all of my posts, Flickr photos, and del.icio.us links in one feed. I also added a Flickr badge to the sidebar of the main page. I have hundreds of photos that I’d like to scan and upload into larger galleries—which would probably choke my free Flickr account—and devote the Photos page to them. The Flickr badge will make it easier to see when I’ve uploaded new pictures. When I have a chance, I’d like to completely scrap the default WordPress template in favor of a custom design. However, that might be a few weeks or months away; right now, it’s just a thought. When I wrote my last post about Katrina, I believed that the situation in New Orleans had sunk as low as it would, but I was very wrong. I knew that people had died and the city itself was devastated, but I never thought that the disaster response would be this bungled. It’s insane that dozens—if not hundreds or thousands—of people were dying of dehydration and starvation in front of American television cameras in America. In a developing nation, a nightmare of this magnitude with an inept response would still be tragic, but not surprising. Tragedies of Katrina’s magnitude rarely result from one person’s actions; they’re systemic products and it’s criminal. Hurricane Katrina and the New Orleans’ levees’ failures were not unimaginable events. An excellent National Geographic article clearly describes the events of the past two weeks in October 2004! It’s chilling to read history when it was predicted with crystal-clear precision a year ago. Really, I’m begging you to read it. Terrorists and tornadoes command the element of surprise, but New Orleans was declared a Federal State of Emergency the day before Katrina struck. So when our president says that the catastrophic flooding of New Orleans was unthinkable, “he’s either lying, grossly misinformed, or thinks the American people are all idiots” (thanks, jb). The tragedy of Hurricane Katrina and New Orleans was foreseeable and preventable; it’s criminal that our leaders did not foresee or prevent it from happening. I received a phone call from Annie that she heard that gas stations in Baltimore would be closing this afternoon because of a fuel shortage. The rumor came from a friend of a friend who works downtown; they were let off early so that they could fill up their vehicles before the stations closed. It sounded a little crazy—we both thought so—that all of the gas stations were running out of fuel, but if management is letting employees out early, it can’t be completely false. So, I figured I would put a few gallons in just-in-case. The gas station closest to Annie’s apartment closed(!) because the tanks were empty; the station’s mini-mart was still open, in case you like visiting fuel-free gas stations for convenience. So I stopped at the Exxon at the corner of Charles and Stevenson for their $3.24 regular unleaded and their exciting one-way only traffic flow to reduce gridlock around the pumps. I still had a quarter tank, but I don’t want to be on Empty all weekend. Besides, my four cylinder Honda only holds 13 gallons; it’s not like I’m driving a Ford Explorer and filling two portable gas containers (true story!). My guess is that it’s an artificial fuel shortage brought about by the soaring prices and a nasty rumor. I’m just shocked that some stations are out of fuel; it’s something new for anyone under 25 years-old. The past 36 hours have brought a much greater understanding of the magnitude and severity of Hurricane Katrina’s destruction. Nowhere has this been more pronounced than in New Orleans, which has descended into a watery hell. Compounding matters is the widespread looting, violence, and societal breakdown for the city. With thousands feared dead, New Orleans’ mayor has ordered a mandatory evacuation of the fifty to one hundred thousand still in the city; more than 500,000 people will be displaced. I can’t think of a single incident in the past century where a city of half a million people will be vacant for several months. It’s probably the best decision possible right now, but still shocking that it’s happening. Some have called Katrina the worst natural disaster the United States has faced; it is definitely the worst in terms of dollars of damage, but seems unlikely to be the deadliest. It’s encouraging to see relief campaigns mounted on several different scales, from individuals opening their homes to refugees to small companies matching donations to massive government and organization campaigns. The next few days and weeks will be heartbreaking as the full damage is uncovered, but I can only hope that New Orleans will be saved and its population reunited. Donate if you can.